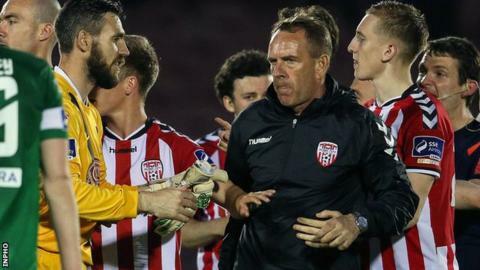 Cork City have rejected claims made by Derry City manager Kenny Shiels that he was subjected to sectarian abuse after his team's Premier Division defeat. Shiels alleges a member of Cork's backroom staff called him a "sectarian name" after Derry's 2-1 loss at Turner's Cross on Friday night. Cork chairman Pat Lyons says the club have no knowledge of the incident. Shiels said he will "not tolerate" any abuse and is determined to pursue the matter further. Derry took the lead through Niclas Vemmelund after 54 minutes but conceded two late goals, with Kenny Browne scoring Cork's winner in the first minute of stoppage time. It was Cork's first victory in three attempts against the Candystripes this season and Shiels was disappointed with the home team's reaction after the final whistle. "I'm really angry at their lack of hospitality towards me at the end as hosts," Shiels told BBC Sport NI. "The way they treated me was outrageous but I'll not tolerate that. I'll fight my own corner. I'm not going to be walked over like that. "I was absolutely disgusted with their behaviour and I'll be making decisions to see what we can do to get something done about it. "They're not going to call me names down here." Cork City manager John Caulfield told RTE he was "surprised" by Shiels' allegation. "I think it was just excitement. He [Shiels] was obviously really disappointed. "We were excited and probably some of our management were excited. "At the same time there was nothing in it and I'm surprised with that comment."